As we take stock, we might recall that it was on this date in 1993 that the World Trade Center in New York was attacked for the first time: a nitrate-hydrogen truck bomb was detonated below the North Tower. 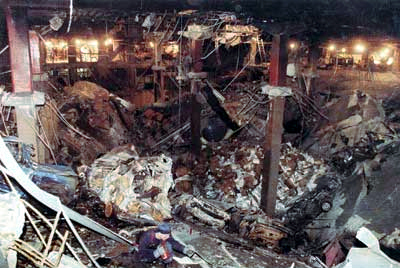 The blast shook the 110 story tower, causing the collapse of several floors in the underground garage, and tore a hole in the ceiling of an adjoining subway; six people were killed, another thousand, injured. The attack is believed to have been planned by Khalid Sheikh Mohammed, a member of what we now know as al-Qaeda, and was executed by a group who were apprehended, tried, and convicted the following year. (Roughly) Daily by Lawrence Wilkinson is licensed under a Creative Commons Attribution-Share Alike 3.0 United States License. Based on a work at www.roughlydaily.wordpress.com. Permissions beyond the scope of this license may be available at http://www.roughlydaily.wordpress.com.